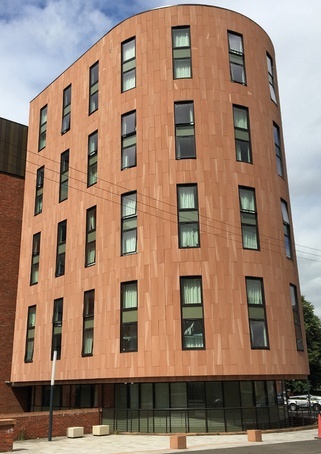 Marshalls provided Locharbriggs sandstone in extra-large elongated portrait format for the exterior facade of a student accommodation block in Glasgow. 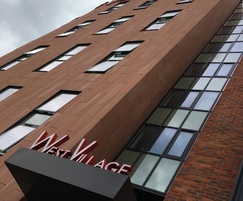 The £65m West Village student accomodation development in Beith Street, Glasgow, consists of two 10-storey blocks designed to house 700 students. 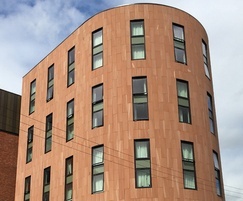 The bespoke fan-shaped radiused façade was engineered from Marshalls Locharbriggs sandstone, quarried from Dumfries and Galloway. 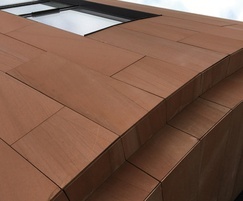 The red to pink sandstone is used throughout Glasgow so was sourced for this project to ensure the building harmonises with the city’s traditional architecture, such as the Kelvingrove Art Gallery and Museum which is situated nearby. 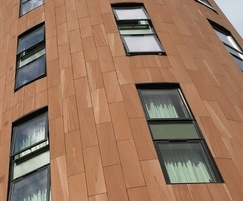 Marshalls provided extra-large elongated portrait panels that were mechanically fixed to a rainscreen cladding system, creating a striking contemporary effect. The plan size of the rainscreen panels was selected to accommodate the building’s radial exterior with the thinner width seemingly curving around the impressive structure. Marshalls also provided coping units in the same Locharbriggs sandstone. Locharbriggs is a Permian sandstone from the Locharbriggs Quarry in Dumfries. 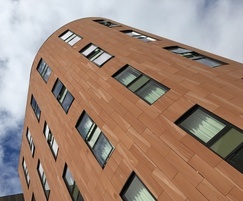 It is a new red sandstone with technical properties ideal for rainscreen cladding, ashlar and masonry products.